The Rockstar himself arrived on the Keystone scene from the Empire State Division of ECPW and launched an all out assault on the Suicide King. Green and the King battled all over the East Coast in some of the bloodiest battles ever seen in ECPW. 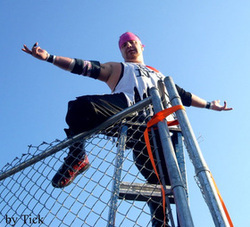 Green's mental and physical attacks on the Suicide King resulted in a violent showdown at the 2010 Caged Fury Event in Hazleton, Pennsylvania which Green lost. The Rockstar returned to Elmira, New York after Caged Fury 3 and has not been seen in Keystone since. However, the impact IB Green made during his brief stay in Keystone will be remembered and the violent encounter between Green and the Suicide King will remain in the memories of Keystone fans for a long time to come.